Two petty criminals walk into a twenty-four-hour supermarket during the night shift, hold the employees hostage and take their place behind the cash register, funnelling the profits into their own pockets. 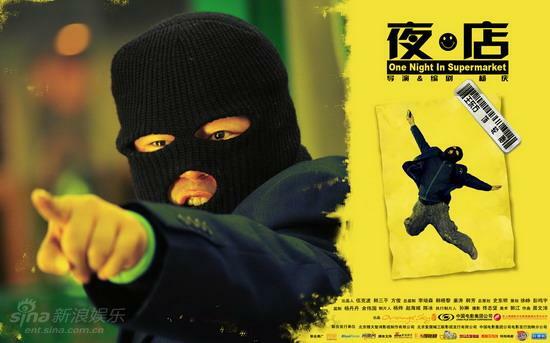 No, it's not a Chinese 'remake' of Kim Sang-Jin's Attack the Gas Station (1999), surreptitious or otherwise. The character dynamics are largely played for laughs, and the ending is a predictable - if admittedly clever - way of reinforcing the mainland party line; the authorities always get their man. 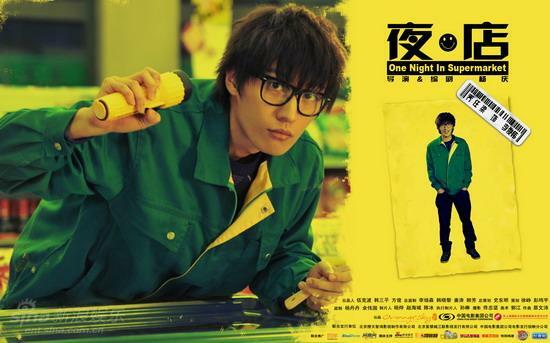 Nonetheless, Yang Qing's debut feature One Night in Supermarket is a fantastic little piece of filmmaking, slick, witty, inventive and - yes - frequently hilarious. The employees in question are shy, withdrawn Li Junwei (bad boy mainland pop idol Kimi Qiao, playing against his stage image) and pretty cashier Tang Xiaolian (Lulu Li). When angry customer He Sanshui storms in, demanding his lottery win which the manageress still hasn't paid him, he's not at all happy to hear she's out gambling and won't be back any time soon. When Li and Tang refuse to pay in the boss' stead, He and his dim-witted muscle Luntai rope them up in the back room, struggle into the uniforms and start working the till. Naturally it doesn't go that smoothly, and part of the fun is watching one mishap after another pile up as the night wears on. Ultimately this leads to misadventures involving a stolen diamond and a jewel thief on the run, but even before that the steady parade of celebrity cameo customers raises a good few laughs. The progression from wry smiles, brief sight gags and minor pratfalls to outright chaos and hysterics is smartly handled in more ways than the viewer might expect. 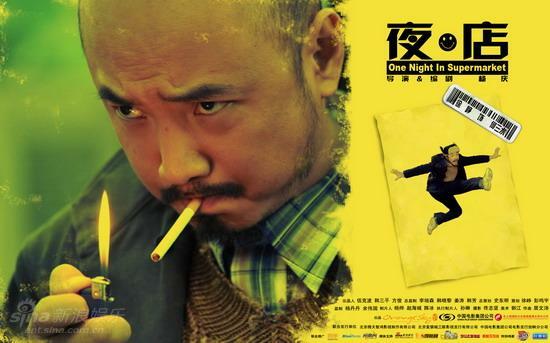 Although the characters are fairly broadly sketched, and the film has more than its fair share of slapstick, Yang delights in subverting expectations from the word go - starting small, with various plot points veering ever so slightly off course, and steadily working his way up to some hugely entertaining third act twists. Even those that come out of nowhere are always plausible enough they never threaten the suspension of disbelief. It's a fairly obvious tack for a debut feature - the film only really has two locations - but (like the Wachowskis with Bound) Yang gets a formidable amount of mileage out of a simple premise, throwing in some snappy CG and effects work, boisterous camerawork and unexpectedly inventive lighting. At times it can feel a little strained. One or two of the effects fall flat and the visuals occasionally seem somewhat overeager when married to the constant shouting, gesturing and general physical comedy, but overall it makes for an air of confidence that's a pleasure to watch. His cast are uniformly excellent, which helps - the script doesn't give any of them too much to do but it's smart, funny and lets the actors build a genuine rapport with the audience through even the most groaningly obvious one-liners. The smaller scale means no-one ends up shortchanged; Kimi and Lulu handle their roles as nominal (photogenic) leads admirably, but even the comic relief gets some dramatic space here, and Xu Zheng (Crazy Stone) as He Sanshui comes close to running away with the film. The ending does kow-tow to mainland regulations - that's really not spoiling much - yet it does manage to buck the rules a little even here, with a note of surprisingly genuine peril, even a little darkness, for what is essentially a multiplex crowd-pleaser. The resolution is never really in doubt but everyone concerned treats it as much more than a foregone conclusion, and the way some of the plot threads wrap up may not be anything out of the ordinary but in context they feel like a pleasingly cheeky wink at the camera. Still, the ending is largely never really in doubt, and along with the occasional crack showing in the production (eagerness to please, holding one note for a little too long and so on) this means the film falls markedly short of perfect. It leaves the viewer with the nagging feeling that a more experienced director might have tidied things up just a bit more, or shown a touch more restraint. All the same, One Night in Supermarket is an impressive debut, a sparkling little comedy that warrants a good deal of acclaim. It was a deserved smash in its domestic market and it's hard not to imagine it'd do well overseas if any distributor saw fit to give it a chance. 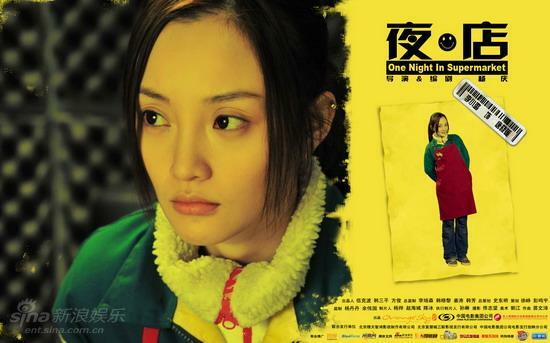 With some clever, eyecatching use of a limited budget and location, energetic direction, a snappy and hugely funny script with a talented cast behind it, for anyone willing to overlook the odd sign of first-time jitters Yang Qing's film is highly recommended. 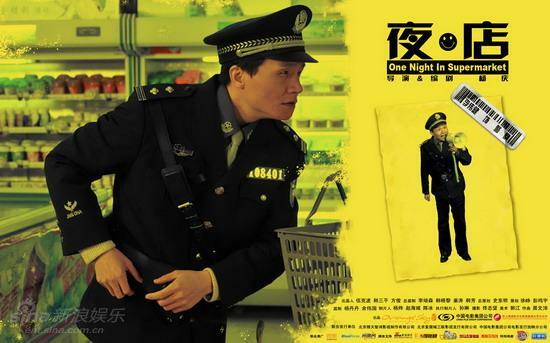 You can purchase the Chinese all-region DVD of One Night in Supermarket here. Good to see you tracked this one down! I'll be sure to check it out when it comes south of the border. This may not be the most legitimate question to ask, but i am reasoning it is worth a shot; where did you find this fansub version?